After our first night in Churchill, we woke up and set out, as we usually do, to explore and find some local treats. What is there to eat in this in a remote, wintry town? Feeling pretty good in our cozy jackets, we decided to walk around town and let the icy arctic breeze move us. We didn’t see too many other people, but we did see a few tour buses which, truthfully, made us feel pretty smug about the fact that we were braving the cold. We even spotted an adorable arctic fox roaming near the school! 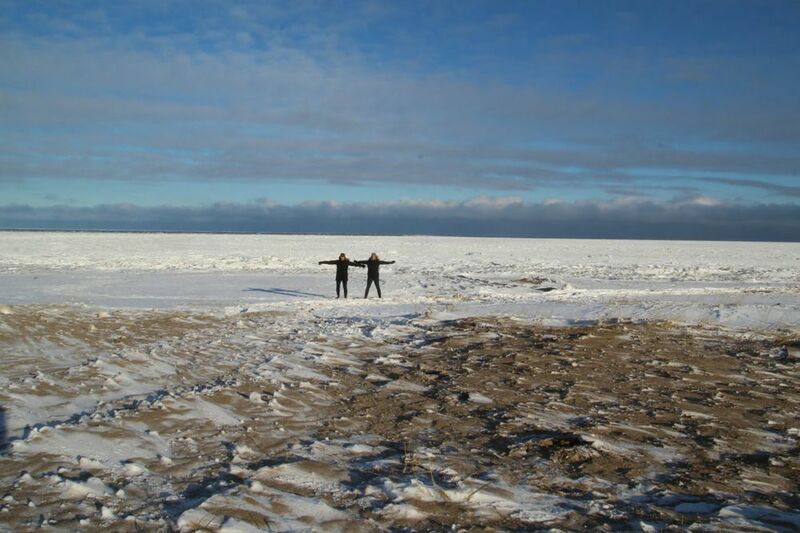 Wanting to see the Hudson Bay, we decided to go down to the beach. The landscape is so incredibly different from the winter landscapes we both know and love. The sky was bright, the terrain rugged and white, and sea ice was forming in large blocks along the shore. With the angles of the Inukshuk to our left, a giant communal fire pit to our right, and the vast Hudson Bay before us, it seemed like the most opportune of times to take a selfie. We put the camera on continuous take, and tried to really capture how happy we both were to be in this incredible place. Feeling satisfied that we nailed the photo-shoot, Lindsay went to retrieve the camera, and I turned to run towards the water—when would I get to be this close to the Hudson Bay again? That was when Lindsay heard “GIRLS, get on the bus, NOW!” from a tour bus that had just pulled up to the shore of the beach. During my journey closer to the water, I happened to see Lindsay head toward the bus, and followed to see what she was doing. The thing about visiting Churchill during the height of the polar bear season is that there are polar bears around, and they are heading towards the sea because they are hungry and in search of food. A momma bear and her cub were just around a rock, out of our view. If it hadn’t have been for that tour bus, we may well have been that hungry bear’s lunch. That is the most intelligent response I can offer. Thank you, kind tour bus! Luckily, our (almost) life-threatening walk yielded more than selfie shame. We found Gypsy’s, a bakery/restaurant that is hoppin’ busy and famous for their fritters. There is nothing like walking a short distance in the cold to make you feel deserving of hot tea and fresh, warm donuts. In addition to things like Manitoba pickerel, arctic char, and caribou on the menu, there are two fritter options: pineapple-coconut and apple. We went for one of each, and could not have felt more rewarded. We self-deprecated over the events of our morning while enjoying each bite of those glorious fritters. Alive and doughnut-stuffed, we couldn’t have felt better. and watched the 3pm sunset over the tundra. Later, we ordered the Muskox dinner. Muskox are native to northern Canada and look somewhat like arctic sheep, but with thick, long, brown coats of fur. Their wool is one of the warmest on earth, and we even saw some hats for sale knit from muskox wool. On the dinner plate, their meat is incredibly tender and lean. We had the muskox roulade with wild cranberries and mashed potatoes. Feeling sufficiently spooked from our earlier encounter, and with the darkness of night fully setting in, we took a cab back to our B&B, only six blocks away, and tucked ourselves into bed. We are tourists, and we have a few things to learn about this wild, frozen land. We now know Churchill is home to great fritters, and that muskox is an animal you can eat. Check in soon to hear about our expedition with Frontiers North, when we saw polar bears from the safety of our Tundra Buggy, and learned a whole lot about these and other tundra animals.